The struggle is over! Learn how to make, mix and generally demystify the elusive 808 low end sounds. 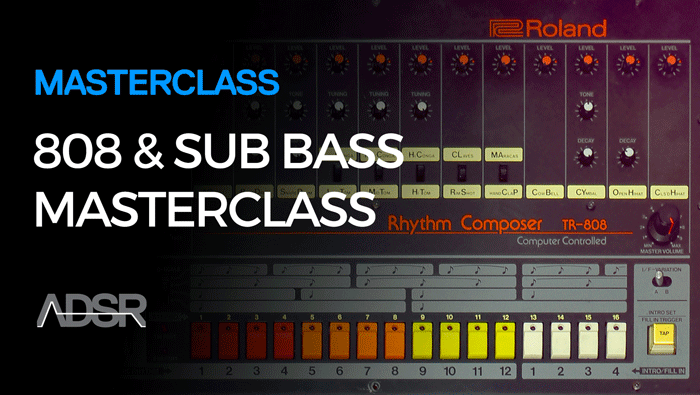 At over 5 hours long, the 808 Sub Bass Masterclass explains everything you need to know and understand about 808’s and sub basses. Led by Echo Sound Works, this course is designed to give you both a theoretical and practical understanding of the 808 sound including what it is, where it came from as well as when and why we use it. It also steps you through exactly how to mix 808s and sub basses, how to make them and which tools and plugins you can turn to achieve a low-end perfect mix. Get the Skills. Raise your 808 / sub bass game. Introduction – This video introduces the course and the topics that will be covered. The Evolution of the 808 – This video dissects the catch all phrase that is “808”. Sound Selection PT1 – This video will teach you how to select high quality sub and 808 samples so mixing your track becomes much easier and quicker. Sound Selection PT2 – This section expounds on the last video by looking at more 808 and sub bass sounds. *As an added bonus to follow along with during the tutorial, you will receive 5 Kontakt sub/808 patches taken from Echo Sound Works personal library, Sub Zero 808, as well as 5 WAV samples included in the download package. Key Selection – Learn how to set yourself up for the most success later when you are mixing by choosing high quality sounds or samples. Playing the Right Pattern – This is most likely the number one culprit of having your 808 and or sub basses sounding weak in the mix. 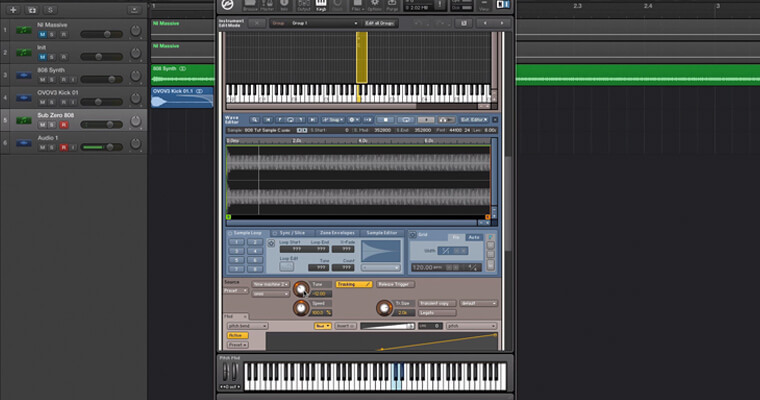 Learn how to arrange your 808’s! Playing the Right Pattern PT2 – This video expands on the previous section looking at other pit falls. Making Room for the 808 and Sub Bass PT1 – Learn how to reductively mix 808’s and sub basses around the other elements in your tracks. Making Room for the 808 and Sub Bass PT2 – This video continues our in depth look at making room in the mix for your 808’s and sub basses. Layering 808 and Sub Basses – Learn how to properly layer and blend unique synths and sounds with your 808’s and sub basses. This is a comprehensive course that covers a wide range of topics and will be helpful for people of any skill level. If you’re just starting out or struggle with your 808 sub bass game, you owe it to yourself to watch this course. As the series progresses, the subjects become more advanced such that even intermediate to experienced producers can benefit, especially from the final series on mixing 808’s. The course is intentionally open ended, spanning Hip Hop/RnB and EDM oriented 808’s and sub basses. 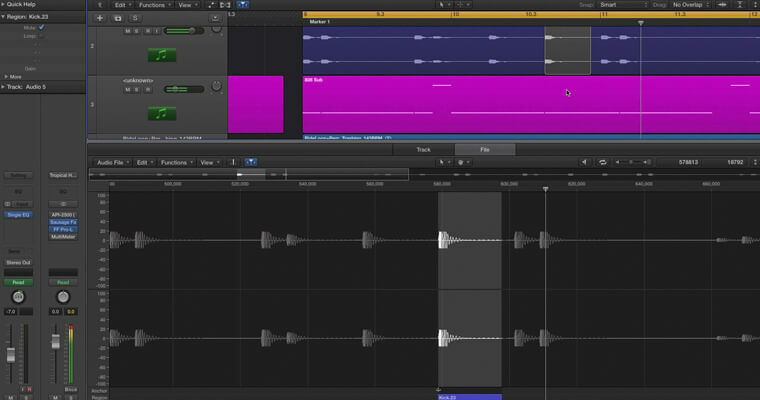 Echo Sound Works demonstrates with Logic Pro x during the tutorial the theory and techniques shown are entirely applicable to other DAW’s. Making Subs and 808’s in NI Massive – Learn how to use an industry standard synth like NI Massive to make a good quality sub bass. Sampling You Own 808’s – Learn how to take a sub made in NI Massive or any other synth and layer it with a kick sample and put in a sampler like NI Kontakt. Side Chain Compression – Learn how to use side chain compression to clean up the low end of the mix. Multi-band Compression – My personal favorite method for getting the 808 and kick or sub bass and kick to live together harmoniously. 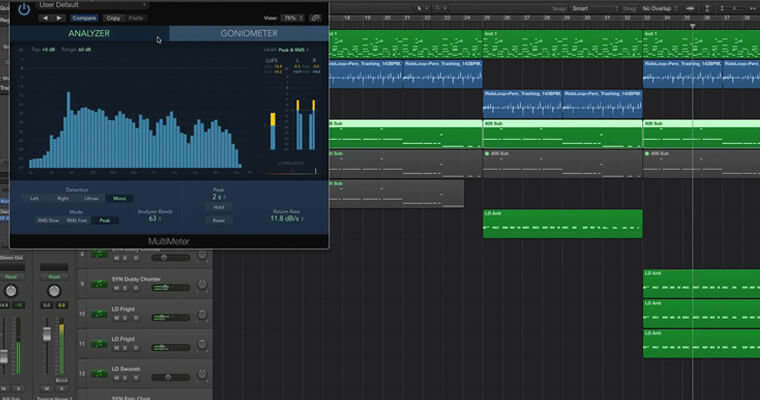 Creative EQ’s – Getting the sub or 808 to sound right isn’t just about surgical reductive equalization. Sometimes applying a few creative boosts can make a world of difference. Saturation and Distortion – These mixing elements fall more onto the creative side of working with 808’s and sub basses. 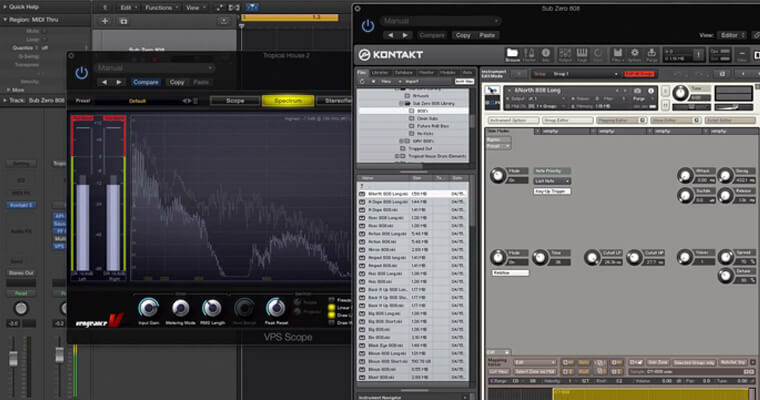 Learn how to bring out the high frequencies of your sub instruments. 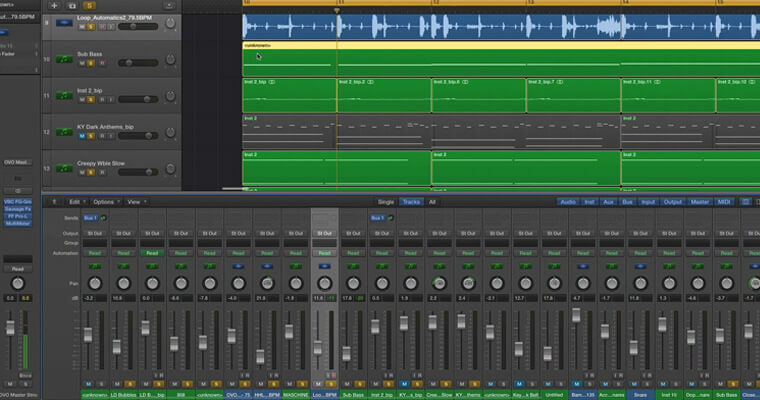 Bass Mixing Plugins – Learn how to use specialty bass mixing plugins to reduce deficiencies in your low end. Mixing Hip Hop 808’s PT1 – This video takes everything we’ve learned up until this point and put it all together by making an 808 progression from start to finish. Mixing Hip Hop 808’s PT2 – This section finishes up our look at mixing an aggressive Hip Hop 808 from start to finish. Mixing Sub Basses in EDM – This video looks at how to mix a clean styled sub bass in an EDM production. Mixing Sub Basses in EDM – The final video is a summary and review of the course with some final tips and tricks to get you set up. 808’s and Sub basses are two of the most difficult elements to get right in a mix. Common traps that producers fall into include misunderstanding why we use 808’s and sub frequencies in a mix, not being able to accurately hear the sub frequencies, or not having the right sounds or samples. This course shows you how to avoid these and other common pitfalls so you get it right first time, every time from here on out. Echo Sound Works is one of the lead tutors on the ADSR network. He is also the sound designer behind the hugely popular sound design label Echo Sound Works as well as a producer. With his years of experience as a producer, sound designer and tutor, Echo easily explains often complicated topics in a way that anyone can understand them. By reinforcing everything he teaches with real world examples, you will come away fully understanding everything presented to you in this course. Raise your 808 game and get your low end thumping!